For Every Bull Market there MUST be a Bear Market. 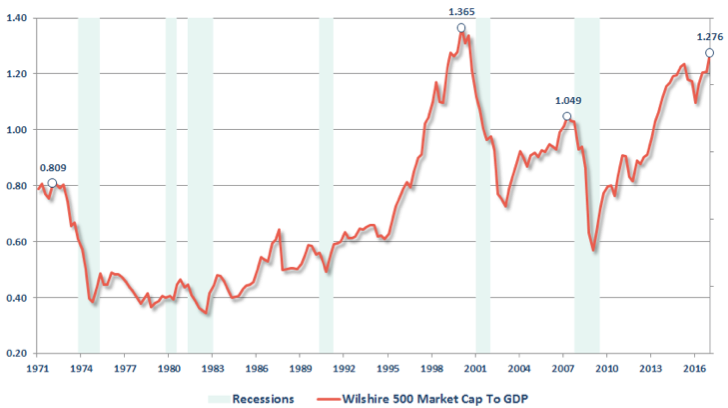 The longer a bull market exists, the more it is believed it will last indefinitely. Investors are mostly individuals that have a “day job” and the majority of their “research” comes from a daily dose of media headlines. 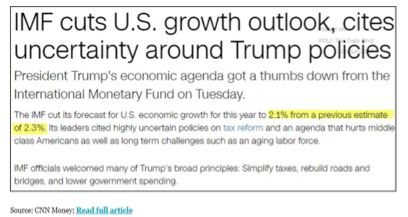 Since the media tends to focus their attention on “market moving headlines,” either bullish or bearish, investors tend to react accordingly. As the market rallies, the greed factor overtakes their logic. During market declines, investors tend to panic with fear taking the upper hand. The market runup since 2014 has been mostly speculative. 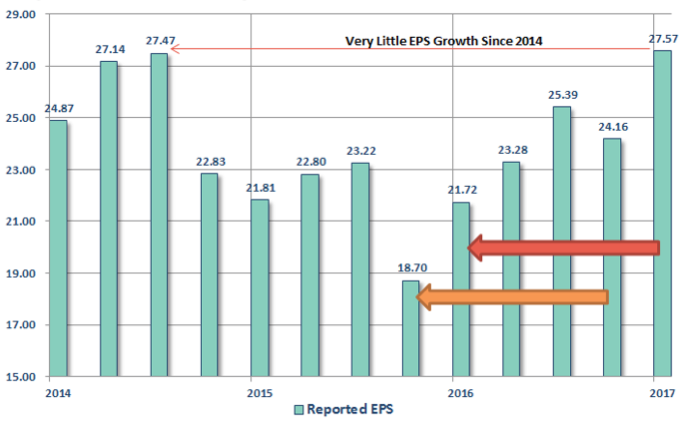 Speculative in the sense that stock price increases have not been based on corresponding growth in the economy or corporate sales, but rather on paying more for static profits i.e., increases in the price-to-earnings ratio. 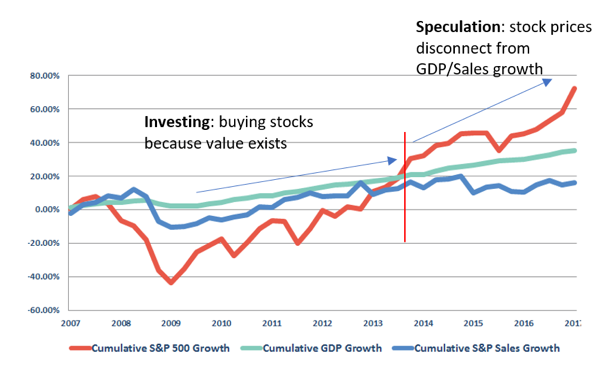 Because rising stock prices have not been supported by either growth in the economy or in corporate profits the so-called Buffett Indicator now exceeds all previous readings except during the Internet bubble. Though the media is awash in stories of how corporate profits have rebounded, that is only true if the comparison is made to depressed levels of 2016. Since 2014, however, there has not been any discernible growth in corporate profits. What are the Dangers Today? Though many are quick to dismiss the rising risks in the markets, it is wise to remember the same beliefs were held in 1999 and 2007. Throughout history, financial bubbles have only been recognized in hindsight when their existence becomes “apparently obvious” to everyone. 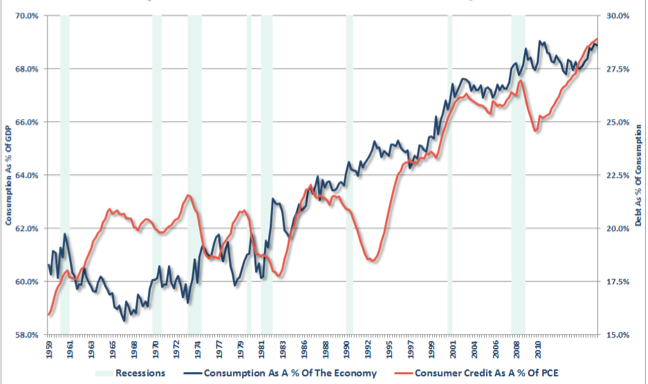 Debt rather than income growth is fueling consumption. Historically, consumer debt as a percentage of consumption has hovered around 20%, today it is about 28%. 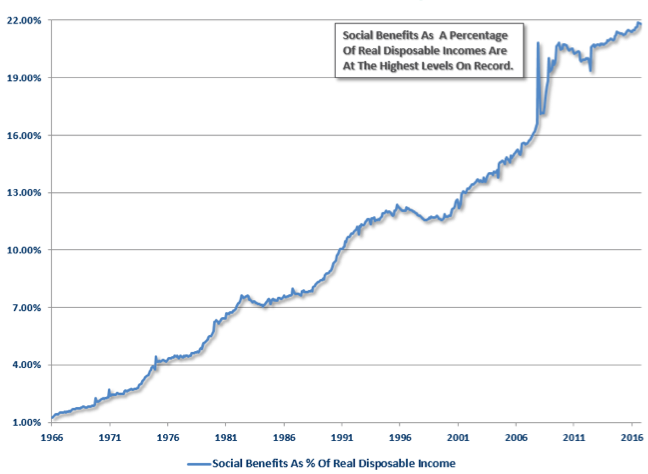 Government transfer payments are at an all-time high as a percentage of income. Because real disposable income has been stagnant, government transfer payments are now 22% of income compared to levels of 7-10% in the 1990s. 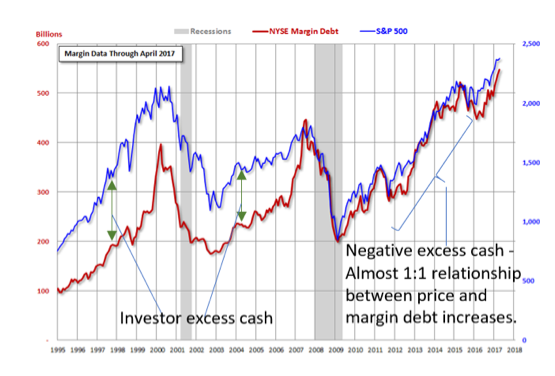 Margin debt is now at a record high. As consumer credit has supported consumption so too has margin debt, or borrowing to buy stocks, supported the current stock market advance. Why is excessive margin debt dangerous? Vacuum causes rapid price declines with little regard to price or valuation measures. Such a scenario results in years of capital appreciation vanishing in moments. That’s the reason to own bonds.